I love greens and this argyle is so fun!! Don't you think? Bags don't get easier than this. Buy a wool sweater. Felt your wool sweater. 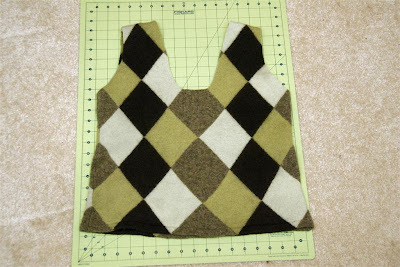 Here is a link at CraftStylish explaining how to felt the sweater. Cut off the neck so that the scoop of the cut matches the scoop of the sleeves. The shoulders will be your new handles. Turn your sweater inside out. 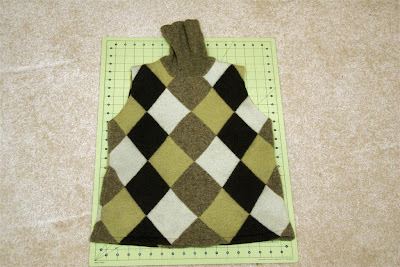 Line up the side seams and sew a seam straight across the bottom. Reverse your bag and you are done! 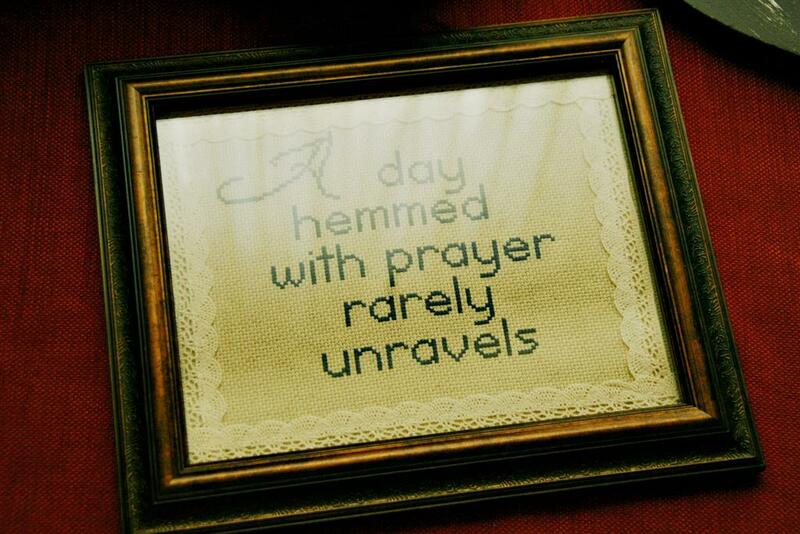 When I was a child my Mom had a wooden plaque in the kitchen that read "A Day Hemmed with Prayer Rarely Unravels." I've mentioned several times what a positive impact that plaque has hand on my life. She made cross-stitched versions for me and my siblings. She gave me mine when they visited. What a wonderful gift. I have a cross stitch my mom made for me which hangs in my girls' room that says "a song in your heart gives each day a good start". This is a fun idea for fall, I'll have to check my closet. I LOVE the bag!! I need to make one! Great idea!!! Fun project! 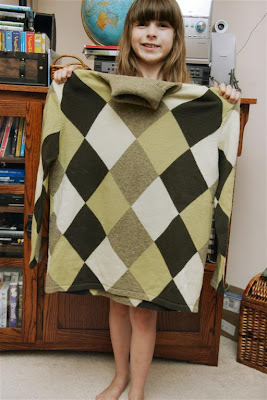 I haven't tried felting a sweater, but it looks like something I can do! Thanks! Beautiful sweater bag - I love the argyle and this is one of the easiest tutes ever! And what is that cool spoon thingy? A candle holder? I love that too. what a cool idea, I love the bag. 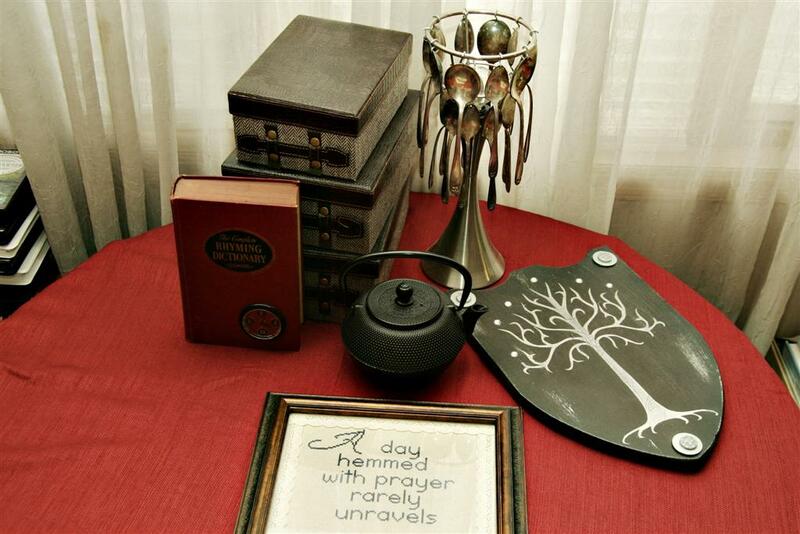 A hand made gift from a mother is a precious thing. That argyle is gorgeous. I rarely find a beautiful wool sweater thrifting, usually greys and blues. Your blog is gorgeous. You have a new follower. I'm such a hoarder, I actually have a few sweaters that I've already felted. This is a great idea. I really love that saying too, what a nice little cross-stitch. What a beautiful gift! I love this saying. I am going to write this down in my journal for inspiration. I love the sweater bag. I am looking for a new winter bag. This is super cute! Hope you are doing well. Sorry I forgot to link up last week. I really wanted too, my daughter got sick then me! You would think this is winter! Thank you so much for linking up your post! Oh no you didn't! That is amazing!! I am SOO going to copy that! Thanks for the inspiration. Love it! What a great sweater.